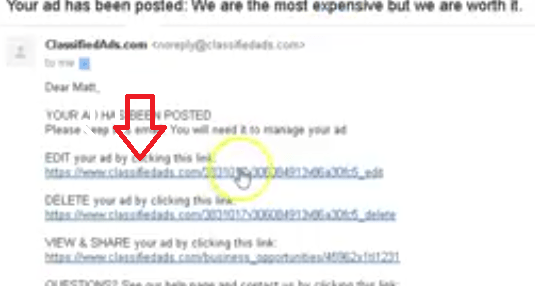 I was posting ads on Classifiedads.com using the automatic classified ad posting software ClassAds.com and I noticed that only the first ad that I posted was going live. All the other ads were deleted! So how do I deal with this problem? 1. Just post one ad. If you are using the software stop the program after you post one ad. 2. Go to your email inbox of the email address you used to post the ad. 4. Classifiedads.com will ask you to create a password. Choose a password. 5. Go back to the ClassAdsCom software and start posting as many ads as you wish. 6. Log into your account with Classifiedads.com here. 7. Click Publish Your Ads. You will see that there is a little button which says “Publish” next to each ad that you have posted. Just click those publish buttons and your ads will go live. It is very quick. You can click 100 ads easily within a minute. That is it! All your subsequent ads that you publish after you post the first one and confirm your account will go live. So far it is working 100%! Classifiedads.com is one of the most popular classified ad sites online after Backpage and Craigslist. You can post your ads manually but if you want to save hours of time you can use our automatic ad posting software here.